The truth really is much stranger than fiction, especially when it comes to the open and admitted future plans of major biotechnology companies. One such case involves a biotech company known as ProdiGene, the officials from which actually faced jail time back in 2002 for contaminating the traditional food supply with ‘biopharmaceutical’ crops that were growing pharmaceuticals and vaccine components associated with AIDS, diabetes, and diarrhea. Contaminating 500,000 bushels of soy with their biopharmaceutical corn that contained pharmaceutical and vaccine components associated with deadly diseases, the company was slapped with a minor $500,000 fine by the USDA (the same government organization that gives Monsanto’s crops special speed approval and ignores the company’s blatant disregard for its regulations). As it turns out, the pharmaceutical crops were actually mixed in with traditional crops and unknowing farmers had already been planted for human consumption. The USDA claims, however, that the crops were confiscated. After receiving the fine and some press coverage on the subject, ProdiGene decided not to apologize but to expand their mission. The company, in combination with estimates by Dow AgroSciences, stated that they sought to reach $200 billion in biopharmaceutical crops within 10 years (as of 2004). Furthermore, they estimated that 10% of the corn in the United States will be biopharmaceutical in nature. In other words, it could contain hidden nano-scale vaccinations, antibiotics, anti-depressants, or any form of pharmaceutical drug. One California based company has even created a spermicidal corn to be used as a mass contraceptive. 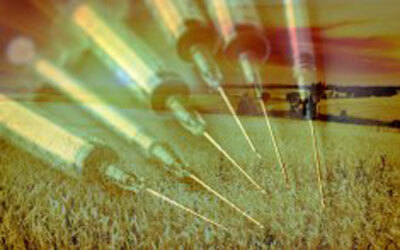 The existence of such technology brings the fight against GMOs to an entirely new level. Outside of the known effects such as recent links to tumors, DNA damage, and other complications, GMO crops on your dinner table could soon contain pharmaceutical drugs like statins in an effort of ‘mass medicating’ the public. Such an effort would likely be used in conjunction with others to fight against those who choose to opt out of vaccinations, delivering the vaccine through the food supply. It may sound absurd, and it is, but is not a new notion. Researchers previously designed a method in which mosquitoes could be ‘flying vaccine carriers’ to inject large numbers of individuals with vaccinations without their knowledge of consent. The information ties in with the recent news revealing that Monsanto now owns a monumental ‘gene silencing’ technology for pharmaceutical use in humans. The king biotechnology company even forged a recent alliance with Alnylam Pharmaceuticals, Inc. to get the initiative started. After all, Monsanto would not lose an opportunity to conquer a large portion of the massive $200 billion biopharmaceutical crop market. Other corporations are looking to get a chunk too, with the MolecularFarming website acting a hub for farmers willing to lease their land for biopharmaceutical experiments across the globe. Touting a net worth of $80 billion in the coming years, investors are continually looking to get their hands on biopharmaceutical growing operations to churn out drug-containing GMO crops for mass consumption - and mass profits. So far, they’ve garnered contracts as far as Zimbabwe to continue their operations. “What will have to happen before the Department of Agriculture takes seriously the fact that millions of people almost ended up consuming experimental drugs and chemicals?” asks Brandon Keim, of the Council for Responsible Genetics in reference to the ProdiGene scandal. If the public grows more aware of GMO dangers with the grassroots support and potential passing of Proposition 37, however, biopharmaceutical farms may never see mainstream success.